Create lasting memories with family and friends while enjoying the open kitchen and incredible food, beer, and wine! We have the most delicious menu available in the Huntington Beach area. Our restaurant has a warm, inviting ambiance and friendly staff that will ensure you have a pleasant dining experience. Our chef has compiled a mouth-watering menu that is sure to satisfy most everyone. There's something for everyone to enjoy! The mother-daughter team of Leo Clancy and Chef Brianne Clancy had always talked and dreamed about opening their own restaurant for close to 30 years. This dream became a reality when the duo opened Heirloom a Modern Farmhouse in their hometown of Huntington Beach in November 2018! From the moment you walk into the restaurant, you will immediately feel the intimate, cozy atmosphere and sense the warmth of the staff as they want you to feel like you are dining in their own home. 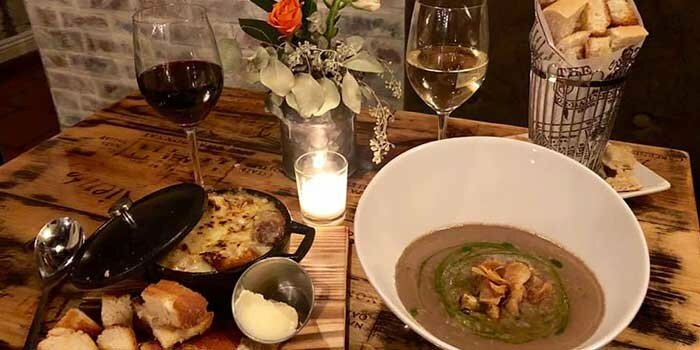 The dynamic chemistry of the incredible food paired with a carefully selected wine list and local beers on tap will have your taste buds exploding with flavor and wanting more! Come be a part of the Heirloom a Modern Farmhouse experience today! “We tried Heirloom for the first time last night and had a great experience. The ambience is "modern farmhouse" but with a warm, upscale feel. The lighting and the music should be noted for setting the perfect tone. It is a small place but that just makes it feel intimate. Kristy was very welcoming and helpful. She had recommendations but we didn't feel rushed or pressured. We love that they encourage sharing. You just get to try more things that way! We had the mushroom soup which had such depth of flavor I know I'll order it again. The sun choke provided a perfect crunch in the soup. We also had the scallop risotto which was delicious. The wine pairing was perfect. Of course we had to try the traditional cheesecake. It was a beautiful presentation with fresh berries (not a "sauce") but more of a dense, creamy (even buttery) texture than "light". It was very good but perhaps not what you think of when seeing "cheesecake". “What a treasure.... I am telling all of my friends! It's a wonderful new restaurant featuring a beautiful menu with awesome flavors. We enjoyed the wine menu and tapas plates. I can't wait to work through the whole menu and savor every bite! This is my new "go to" spot on Beach Blvd. “My wife and I love this place. We're working our way through the menu and after three visits we've loved everything. We typically share several small plates however on our last visit I wanted to try the Short Rib Bourguignon which is an entree. I was amazed at the depth of flavor in this dish and how tender it was. We also love sitting at the bar watching our food being prepared and chatting with the chefs. Please enter your questions about reservations, private events, gift certificates, or other items here.